A Bright purple [Matte] shade. 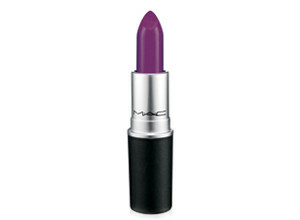 I know many woman would be afraid of wearing purple on their lips but in my humble opinion the Mac Heroine lipstick is just simply the perfect shade of lipstick for woman of colour. I saw a picture of Mindy Kaling (The Mindy Project) wearing this shade and it popped so much on her skintone that I had to have it. It has the same Wow factor that red lips has on light skinned woman. I tried the purple Revlon Colorburst in 215 Shameless, it was nice but but too dark to give that Wow factor. I stepped into Mac and they immediately brought me Heroine. I was so happy I bought 2 of them just in case they discontinue the shade. I wear Heroine all the time and the purple shade is so good it even works for the office. My workmates admire the shade, and I’ve gotten several comments on how well it works on my skin tone. Not one of the best Matte MAC lipsticks, it turns pinkish after a few hours which isn’t usual compared to the other shades in this range. I love this lipstick simply because it stays on and it suits every skin tone. I’m dark and it looks really good on me. My friend is lighter and it still looks good on her too. Good value for money. Love it!! Pricey but worth it! I love this lipstick!! The colour pops, no constant re-application. food and drink resistant and moisturising as well! I usually struggle to find lip products that keep my lips moisturised, Mac does! I have always been a MAC lipsticks kinda girl/ Heroine is my favourite this summer. It is a bright colour that goes with almost any colour of clothing. I am so addicted to these beautiful colour. It lasts so long, I don’t have the stress of re-applying. I love it.